In all cases the drive should be selected such that the maximum speed is above the speed N2cp as maximum power is only delivered above this speed. To make the most economical selection it is necessary to determine the actual torque or power requirement and the speed range over which it is to be used. 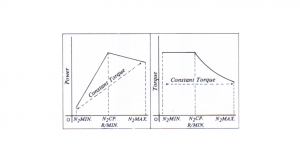 Characteristics of the torque or power should be established. 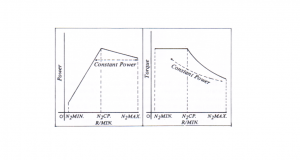 The diagrams illustrate typical power and torque curves for Motodrive and/or Motodrive/reducer combinations. 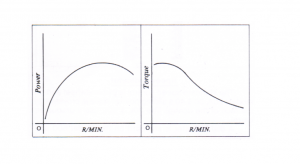 The constant torque line has been plotted on these curves. 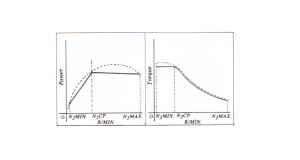 The torque plot MUST be below the curve for the drive. Again, the power requirement must be below the plot for the drive. Types (c) and (d) should be referred to our sales office, quoting all details of the drive.